Love these so much around my glass table. They are comfortable to sit in and the weave is nice too. They look expensive without being expensive! I highly recommend them. 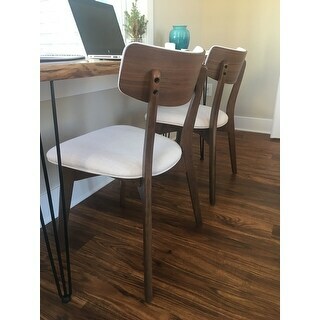 In true mid-century style, these rubberwood dining chairs feature angular frames and curved seat backs. The plush, padded seats are upholstered in durable polyester for easy care. Choose from two wood finishes to pair with your existing furniture. 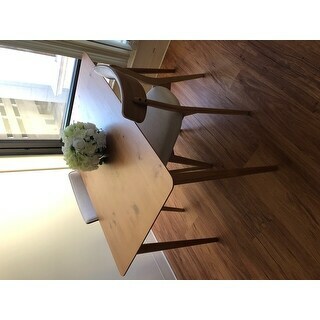 These chairs are adorable and fit perfectly with my mid-century dining table. I ordered the oak finish with beige and absolutely love them. The seat is a bit firm, but I'm sure it will become more comfortable through use. It took around 40 minutes to assemble the chairs. Overall, great chairs for the price! Comfortable, sturdy and beautiful combination of wood tone with fabric! 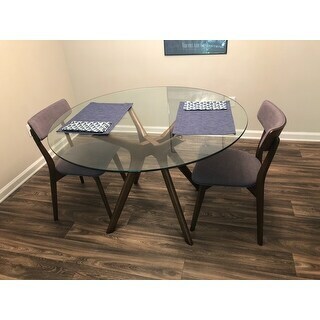 We purchased 6 for our main dining room table; given the width of the chairs I think we will be able to seat up to 10 comfortably (we also have a bench). Christopher Knight products are very easy to assemble and hold up well to daily use. We look forward to using these chairs as we all dine together! FOLLOW THE INSTRUCTIONS. My husband skipped the instructions, put them together incorrectly, and complained about how they looked/fit together. After reassembling them CORRECTLY we both love them. The walnut colored chairs are a beautiful, rich color that almost perfectly match our walnut dining table. They're solid wood, so that's awesome. Very sturdy for furniture that you assemble yourself. The padding is firm, but comfortable. Kind of a perfect compromise between hard and soft. Fabric feels durable. The back of the chair is our favorite thing about these chairs, though. We are an average height (5'7 & 5'10) and the backrest is situated in such a way that it provides support WITHOUT angling you forward. It allows for a slight backwards lean. Super jazzed, and at $ per chair it's hard to beat. Ordering 4 more to complete our dining room. I love, love these chairs! Putting them together was super easy and they have such a high quality look. The gray is a beautiful charcoal gray and the wood frames are so elegant/quintessential mid-century modern. The cushions are a little on the stiffer side, bower, this seems normal for dining chairs. 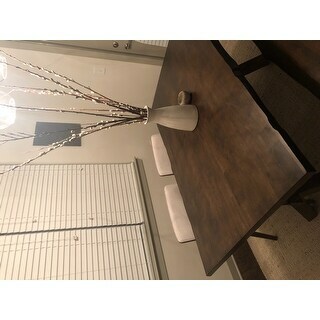 This was my first time ordering furniture from Overstock and what a pleasant experience! 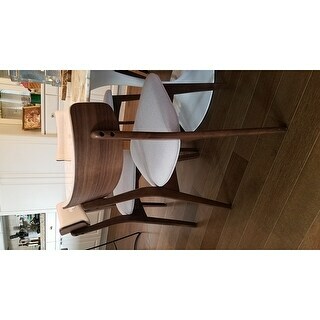 Very high quality looking chairs and the perfect way to instantly have a mid-century modern look and feel. The blue color is beautiful and true to the image. The fabric is very nice as well. 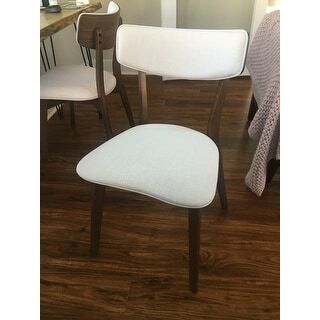 These Chazz mid-century fabric dining chairs are so sturdy and cute. The chairs that came with the table I purchased were cheap looking so I bought these chairs. I'm so glad I did because they are super cute. I have been searching for the right chair to go with my round marble dining room table for a while and this chair was the winner! 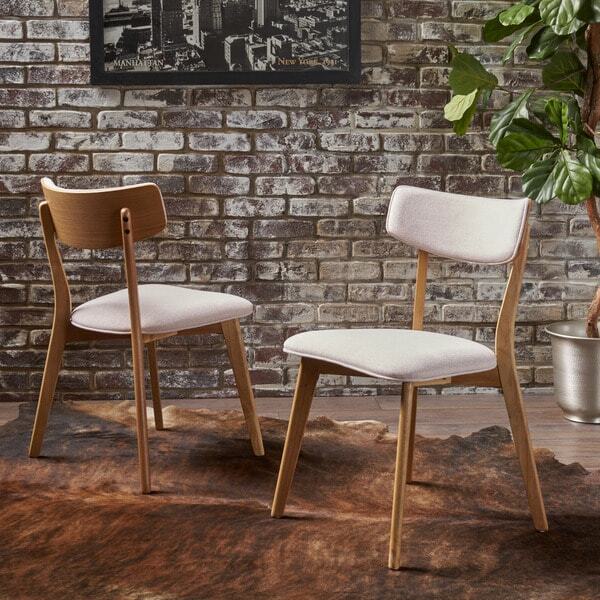 The walnut finish is classic - the chair is sturdy, comfortable and is the perfect size. I purchased 6 chairs, all very easy to assemble and the directions were intuitive. 2 of the 6 chairs were a little wobbly after installation, sent an email to customer service and we received two new chairs within the week! Each chair took between 30min to an hour to install. Once you get the hang of it, it was pretty quick. Highly recommended! Received many comments! These chairs require assembly. One of ours is defective. There are 4 holes in the back piece for inserting screws. 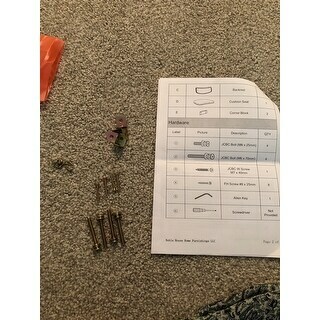 There are supposed to be metal inserts in the holes that hold the screws. Holes were drilled but all 4 plugs were missing in the one chair. Fortunately we have a friend who does woodworking and happened to have inserts that fit the screws, so we do not have to go through the return process. Thank you Dave! Once assembled, the chairs look cute as pictured, but they are not sturdy. Cheaply made. I bought them for my husband's office so they will probably work. Recommend ONLY for light use however. In my opinion, these chairs will not withstand regular daily use. The 4 chairs arrived this afternoon and we had dinner using them this evening. We chose the oak and grey combo and love the way it looks with our oak table. The directions were easy to follow and the seats are comfortable and solid. 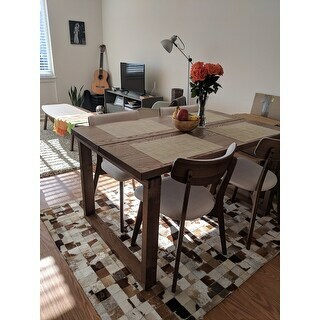 We are very happy with our purchase, and the price was great! Great value. Love the design. They seem well made and logo great. Also easy to assemble. Chairs completely met my expectations in aesthetics and function. Very easy to put together. One of the chairs had a broken leg which was a bummer. But Overstock made really easy to return and replace the item. Look great, very sturdy, and easy to put together. I like them so much I'm about to buy two more. chairs did not meet my expectations.. i think the quality is lacking. if i didn't already have the chairs assembled i would return them. I was greatly disappointed in my purchase. The back rests, in three out of the four chairs ordered, did not line up correctly. Had to return the entire order. 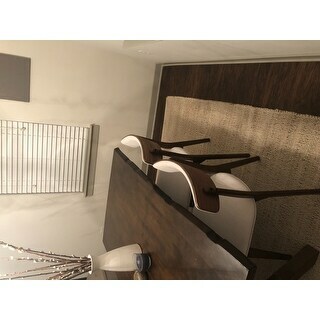 Apparently Overstock knew about this problem but still continued to sell these chairs. Comfortable, sleek, easy to assemble. Very solid chairs for the price. These chairs are awesome! Easy to assemble, the quality is great, they look like you would have paid $ per chair- but the set was only $ish. Definitely super happy with my purchase! Plus, they look AMAZING!!! The chairs are beautiful with great lines. Note that the grey has a slightly purple-ish tone depending on the light, but it is very neutral and pleasant. We will buy more. We don't have a set weight capacity for this item, however, we don't recommend anything heavier than 250 lbs. "Can these chairs be re-stained/finished?" All items are pre-treated already. Items were not tested for other protectants. "Is the Oak finish a very light oak or is it a medium oak stain? 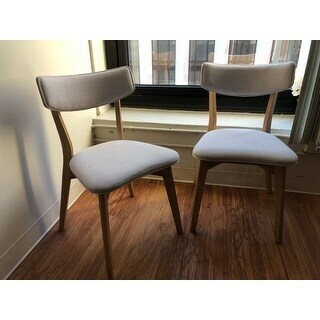 Wanting to pair these with a Teak table and wondering if they will be a good match?" "What height table fits these chairs?" We cannot recommend as we have not designed a corresponding table to with these chairs. The overall dimensions of these chairs are available for the customer to decide on a table of interest.